For 7 nights, pay for 6 nights only. Goldeneye is nestled among tropical forests and lush gardens on a seaside bluff overlooking the Caribbean where you can put a little distance between yourself and the rest of the world. Our lifestyle is pure Jamaican in rhythm and tempo, "easy". We offer you a window to local culture and a different way of living. Goldeneye is also historic. This is where Ian Fleming crafted all his James Bond novels. What Fleming loved most about Goldeneye was the out of doors, nature, the sounds and colors, the peace and drama of living by the sea. He delighted in "the blazing sunshine, natural beauty and the most healthy life I could live." Little Shaw Park Guest House is only five minutes from the town centre and beach is close to all attractions. 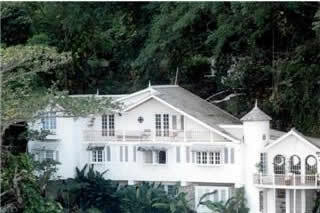 A short walk to Milford Falls and the magnificent Shaw Park Gardens, and near to Dunn's River Falls and Calypso Rafting. It is a beautiful place - a place of great tranquility with luxurious rooms and studio apartments and over an acre of well kept gardens of tropical plants and flowers. 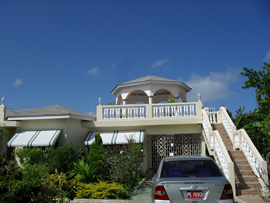 There are great views overlooking Ocho Rios Bay and the ocean. Little Shaw Park Guest House is a licensed guesthouse and highly recommended. Scotch on the Rocks is a luxury 5 bedroom villa, resting on Ocho Rios beautiful Sandy Bay, only five minutes from the town center and Two hours away from Donald Sangster International Airport, Montego Bay.